Ooh it's a bleak dystopian future! Tv-ooh loves a bleak dystopian future! Admittedly, tv-ooh's not so big on blood and gore and slit throats - oh that poor, poor social worker - but that's all part of the deal with Being Human. Well, that and the razor-sharp witty quips that would put the writers of Friends to shame - a fact even more remarkable given the dark or life-threatening nature of many of the scenes in which these quips appear. Tv-ooh would be panicking if faced with a werewolf, not quipping. And as well as that bleak and mysterious depiction of London in 2037 - all subterranean Victorian tunnels and nicely retro chains of light bulbs pinned to the roof (you can just imagine this secret society of vampires planning the interior design: "You know we really need to pick out that brickwork detail.") - there was lots of New Stuff going on, and a handful of new characters, which will (hopefully) make sense over the coming eight weeks. This fourth season of Being Human is working hard to reboot itself. It's got a lot to do: the show's lost three of its four leads: long-haired vampire and mass-murderer Mitchell's gone, killed by werewolf George at the end of last season, while, off screen, George's girlfriend and fellow werewolf Nina was murdered, too. What, no over-wrought leaving scene? And then there's George himself: Russell Tovey, who played him, has said the thought of doing the show without Aiden Turner (as Mitchell) would be strange, so he's left now as well, which also probably explains why Nina had to go. George got a fitting (ie bloody then tearful) end: he forced himself to change into a werewolf in order to escape from a prison cell so he could rescue his baby, Eve, but in doing so, and without the usual influence of a full moon, his transformation gave himself major organ failure and died within seconds, but not before naming his baby. Disappointingly, at no point did he add: "I'm off for a film career, darlings!" 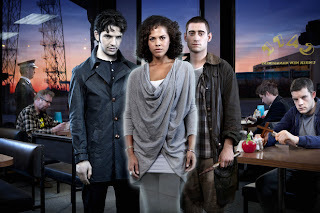 So that only leaves Lenora Crichlow as Annie, a ghost that only werewolfs or vampires can see, and a character forever stuck in a grey cardigan. Hopefully, given her status as the sole original cast member, she'll get more to do now than the usual 'supporting character' stuff she'd regularly get given - werewolves and vampires seem to get much more action than ghosts - perhaps ghosts aren't in Equity. Annie is joined by new two new sidekicks, werewolf Tom and vampire Hal, but some fans are worried the cast changes might damage the show. That, of course, remains to be seen, but the programme should be just fine - and the notion that a show can't sustain major cast changes is a bit nonsensical, frankly. Fans might miss favourite characters, of course, but that's something different - and behind the scenes, it's still the same team at work, and good drama is mainly about good writing. Even so, Being Human has come a long way from its slightly 'quirky supernatural comedy drama' origins, so a new cast and new mythology is all part of its evolution - and those scenes set in the future offer plenty of teasers of what may be to come: there's 'a war child', who might be Eve as an adult, and we see her going off on a mission of some kind. And then there's Tom: he slayed a couple of vampires and quipped about the time his parents got eaten. In other words, business as usual but with different faces. Like we say: blood and gore and slit throats with quips.